Now that it's been received, I can tell you about a baby quilt that I made for my friend, Melanie (well, for baby Camryn, actually). When I saw this pattern, I knew it was the one to make. The bees and the z's - I couldn't help but think of Melanie and her fondness for things with bees. I had thought when I started this quilt, that it would be quick. Ha! I actually got the blocks all cut and put together in 2 (longish) days. I thought I was so close to done. That was in January, before the baby shower. I toiled away for then next month and a half stitching the faces on the cute little bees. It was fun, as I expectantly waited to hear the news of Camryn's arrival, and prayed for healthy mom and baby while carefully crafting each unique face. I got the faces done the day before Camryn was born, and shot off a quick comment to Melanie's blog, lest she was being subconsciously held up by an unfinished project (even though it wasn't her project, not that I thought that was really holding her up.) I thought I was almost done, but again, my estimates were not on par with the reality of life. No fear! 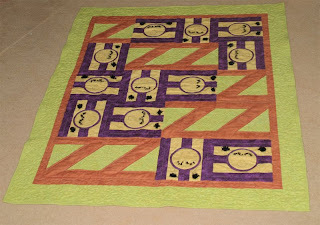 I plugged away over the next weeks, finishing the top, preparing the backing, and taking it off to the quilt shop for them to quilt it with their handy dandy quilting machine. 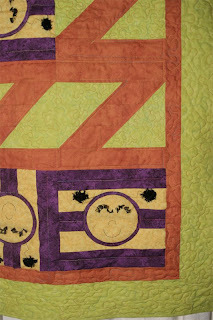 (If I had tried to hand quilt it, Camryn would no doubt have been in college by the time I finished her baby quilt.) It was poor timing on my part, as they were busy with other quilts to finish. So, I twiddled my thumbs while the quilt was in line to be finished. After I got it back, I made quick work of it! On with the binding, try to catch all the stray threads, into the box! So, one month (to the day) after Camryn's birth, I got the quilt packaged and ready to go for shipment. I really enjoyed making that quilt. Elizabeth seemed fond of it, as she kept trying to play with the bees every time I laid it out on the floor to work on it. 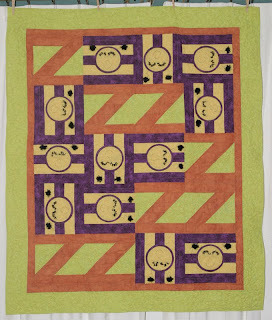 Unfortunately for her, this quilt is for another baby to enjoy and wear out. Congrats on your precious daughter, Melanie!